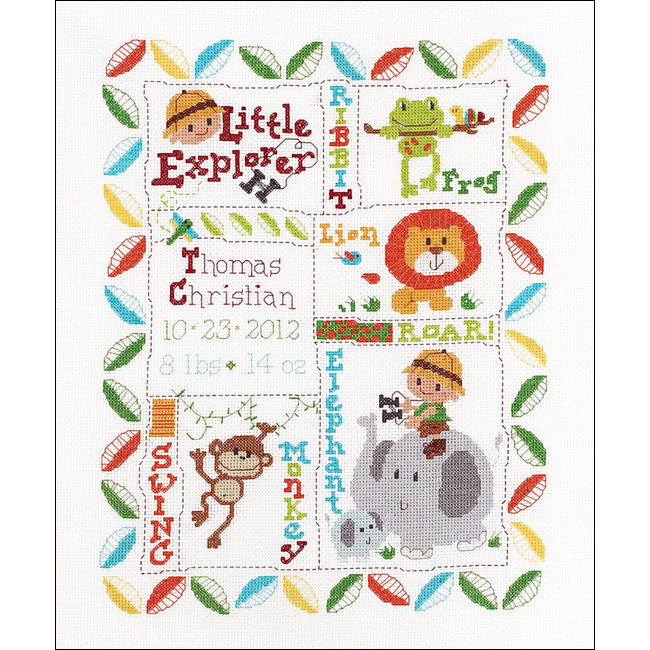 See our newest selection of Baby Cross Stitch Kits from the Bucilla Baby collection! 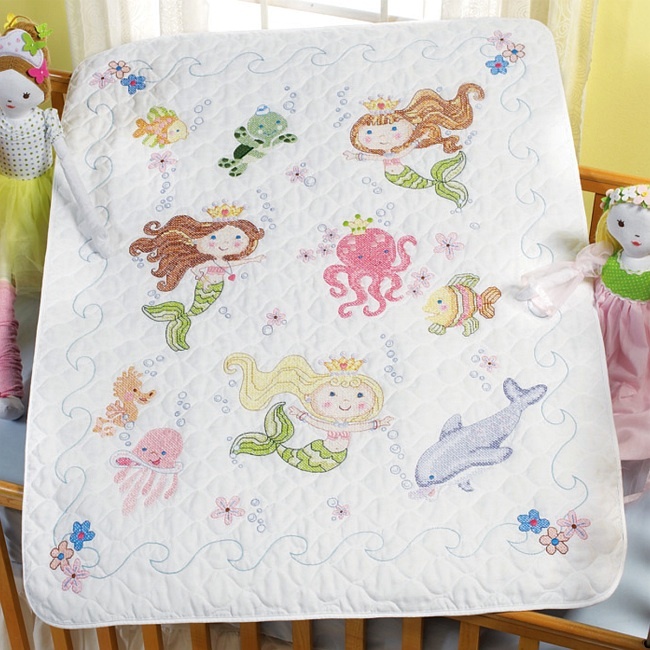 Little Explorer & Mermaid Bay are coordinated baby ensembles, including crib covers, baby bibs, and birth records. 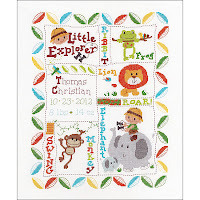 Little Explorer is a safari-themed collection, featuring a little explorer and adorable jungle animals. 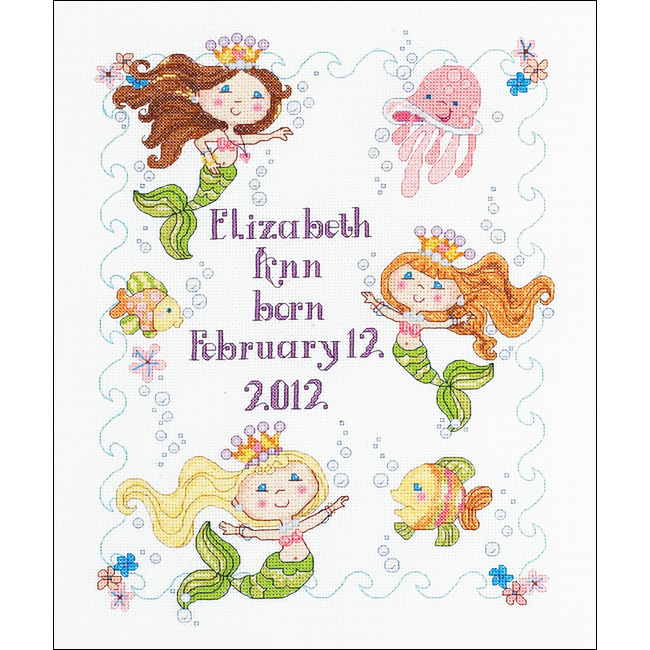 The Mermaid Bay collection highlights three cute little mermaids in an under-the-sea scene. Crib Covers are a Stamped Cross Stitch Kit project. Kits include a pre-quilted, pre-finished baby quilt, cotton floss, a floss separator, embroidery needle, chart and instructions. 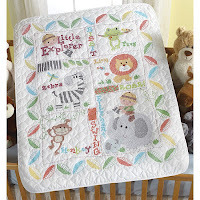 All the materials you need to make a beautiful embroidered quilt for baby's nursery! 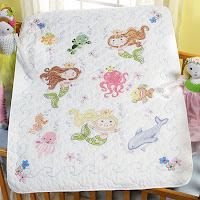 The cross stitch patterns are pre-stamped on the quilt fabric with a wash-away ink. It's important to not wash the fabric until after the project is completely stitched. When you are ready to wash the ink out, follow the care instructions included in your kit. Baby Bibs, like crib covers, are a stamped cross stitch project. 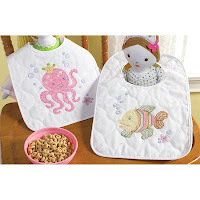 Kits include a pair of pre-quilted, pre-finished baby bibs, cotton floss, a floss separator, embroidery needle, chart and instructions. All the materials you need to make 2 embroidered bibs for baby! 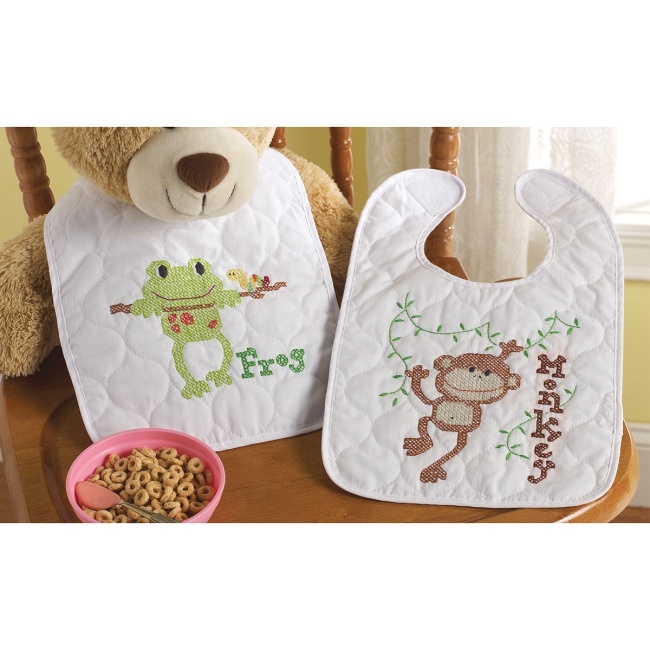 If you're new to stamped cross stitch, baby bibs are an ideal starter project. The smaller size makes them easy to handle and quick to finish! Bucilla stamped cross stitch kits include easy instructions for beginners, including diagrams, design chart, and color key. Birth Records are a Counted Cross Stitch Kit project. Kits include 14-count white Aida, floss, a floss separator, embroidery needle, chart and instructions. Everything you need to create a lasting keepsake of baby's birth, perfect for display in baby's nursery! The cross stitch patterns are provided on a chart. Unlike stamped cross stitch, the pattern is not pre-printed on the fabric. Counted cross stitch placement is achieved by counting squares in the fabric according to the chart provided in the kit. If you're new to counted cross stitch, the DMC website offers a helpful Cross Stitch Overview for beginners. You'll find great articles on getting ready to cross stitch, reading a cross stitch design, learning the stitches, and more. Visit the Embroidery Kits section of the store to see our complete selection of embroidery kits, including stamped cross stitch kits, counted cross stitch kits, crewel embroidery kits, and more. 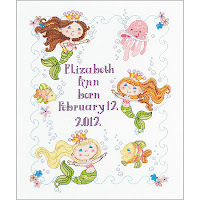 Weekend Kits specializes in Creative Art & Craft Kits for adults, teens, and kids. Stop by today and be ready to embroider a lasting keepsake for baby on your next Weekend at Home!